Inflation remains pretty Germanic, at a current +1.9%, the best in Europe (bar Greece, still bizarrely putting up a positive inflation rate in the depths of a recession!? What a broken bloody economy!). However, Germans (& investors) are v aware of the fiscal deterioration elsewhere in Europe, and the monetary actions of the ECB to date & to come. Generational memories of the effects (& consequences) of inflation remain strong in Germany, and fear may well prove a major factor in increasing demand for property. In the final analysis, aside from the merits of its absolute attraction(s), it seems more than obvious Germany will retain its relative economic & investment advantage vs. the rest of Europe. Even in a worst case scenario, a major portion of capital invested in Europe obviously doesn’t just up & leave – it simply gets re-allocated towards safer/more attractive European investments & countries. Bunds are to Europe’s investors what US Treasuries are to US/global investors! Yes, this flight to safety in Europe has been particularly advantageous for Germany. But remember, many institutions (like pension funds) can respond with glacial speed to events/trends of recent years, and to Europe’s shaky near/medium term prospects. I’m convinced this means we’ll see continued & increasing investor flows/allocations into German bonds, property & equities for years to come. Bunds: Likely to remain an attractive safe-haven in the medium term, both for European & global investors. But Bunds (like most Western bonds) will eventually become increasingly risky with the likelihood of significantly higher (threatened, or actual) interest rates & inflation. In addition, there’s a real possibility of some type of European debt mutualization/guarantee scheme, which could also seriously compromise the safety of Bunds. Property: Prolonged low interest rates, the ultimate threat of higher inflation, and the eventual rehabilitation of Europe’s banks offers up the perfect recipe for significant gains in property prices! 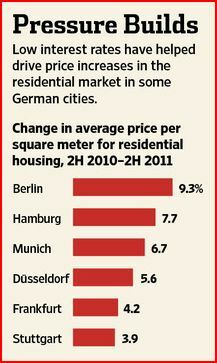 Best case, Germany’s cheap property valuations offer great investment leverage. Neutral case, Germany’s sound/attractive domestic economic & property fundamentals offer the best defence. Worst case, property/asset investors could still benefit significantly from potential hard-Euro/new Deutsche Mark appreciation. German property, esp. 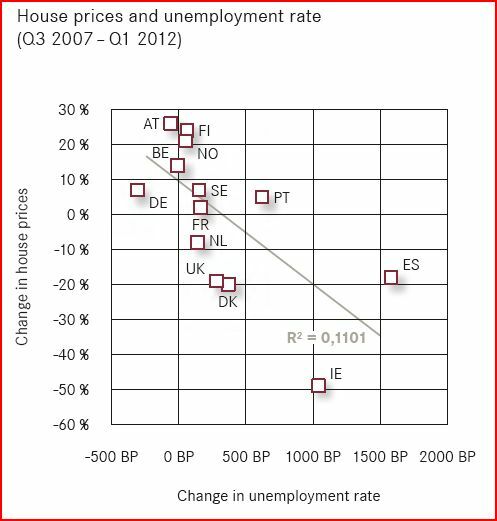 residential (obviously more domestically focused), clearly seems to offer the best medium/long term risk/reward for investors – particularly for European investors suffering through the current sovereign debt crisis. OK, of all the German residential property companies I track (which I’ll return to), take a guess at the yield on their property portfolios? No, not the average yield – the minimum yield? a) The P&L Impact: German companies are relatively conservative – they tend to hedge a major portion of their risk (i.e. they lock into fixed rate swaps). This means much debt is still being carried at avg. 4.5%-5%+ effective rates. With rates remaining low, companies will enjoy a major tail wind as debt rolls off for years to come & is replaced at cheaper rates. A 150-200 bp improvement (to the low 3%s all-in) is indicated from recent newsflow. The P&L impact will be magnified with further rental increases & improving economies of scale. b) The B/S Impact: A host of other factors determine property valuations, but long (& short) term interest rates exert an enormous influence also. Current 3 mth EUR LIBOR’s 0.13%, the 5 yr Bund’s at 0.59%, and even the 10 yr’s only 1.58%! This collapse in yields will feed through into higher property valuations, and leverage will then provide a disproportionately positive impact on Net Asset Values. Revaluations will also lower Net LTVs, freeing up borrowing capacity – leading to continuing/increased demand for more portfolio acquisitions (& economies of scale). c) The Investor Impact: Another version of the B/S impact – investors face a prolonged period of these ultra low rates for their cash/bond investments. As we all know, this will inevitably force investors into other asset classes… A property yield of 7%+ will prove incredibly tempting, esp. 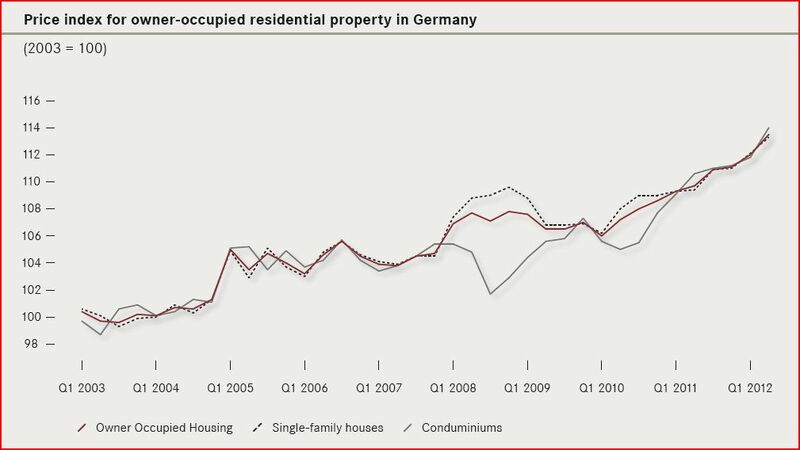 if investors perceive German property’s safer than (regular) equity exposure. This preference will ultimately manifest itself in higher property valuations, premium price/book multiples for listed property companies, or both. But what if the first valuation chart started from a massively over-inflated base level? Oohhh, Betty – you are funny! Nothing’s further from the truth. 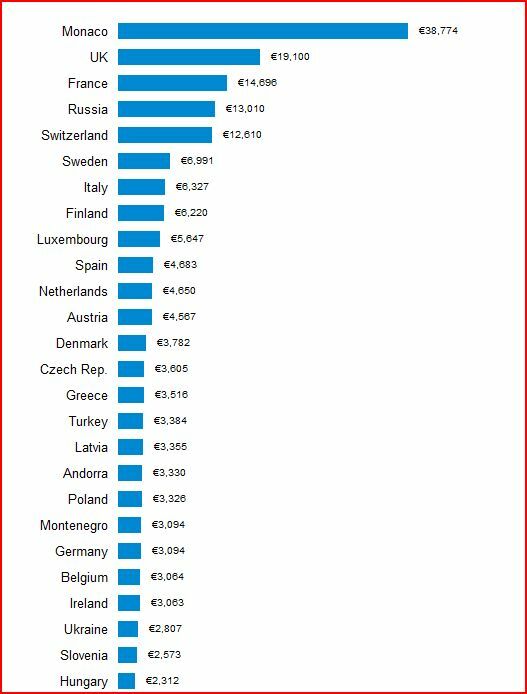 Look at this chart of relative European property valuations – what, is Germany located somewhere in Eastern Europe!? An average German price of just over EUR 3,000 per sqm looks wildly anomalous vs. the rest of W Europe. And that ain’t the ‘alf of it, guvnor! A major portion of listed German portfolios were sourced via wholesale purchases from municipal/housing authorities, so their average asset values are far lower than the value charted above. In fact, they’re less than EUR 1,000 per sqm..! I’m not sure it’s even a question worth debating. Often, major long term success comes from recognizing markets tend to abhor an arbitrage, in the broadest sense of the word. Whether you’re a business, or an investor, there’s always a migration towards cheap labour, cheap assets, higher profits, higher yields etc. The process may be slow, but it’s relentless… The perfect long term/low-maintenance portfolio is ideally stuffed with investments that exploit those long term arbitrages. Investing in emerging/frontier markets is one v obvious play, and I believe German property (particularly residential) is another different, but equally compelling, opportunity.